Main Street is always the most charming part of Disneyland during Halloween Time. With its bountiful lit jack-o-lanterns and autumn tapestry and spooky storefronts, it really recalls the nostalgia of classic Halloween. 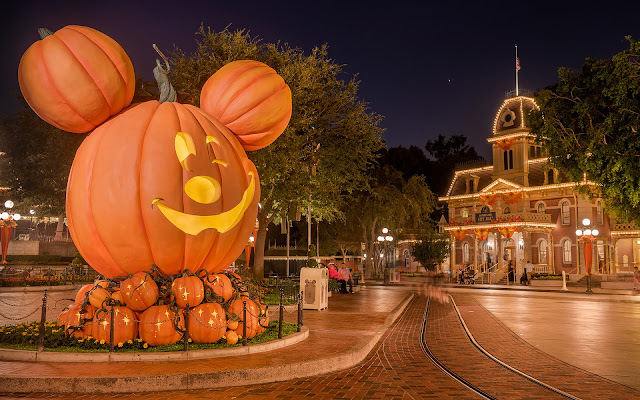 And of all the jack-o-lanterns, it's the giant Mickey Mouse one that attracts the most attention, getting guests posing for photo ops throughout the day and night and then even after that. It takes a lot of patience to get a fully empty shot, especially since there's always the threat of security clearing you out after the last other guest has snapped his or her photo but before you've had a chance to take yours. Would you believe the scene below was shot after 1:00am? It's true. A full hour after Disneyland has closed, people still linger, with no signs of leaving, savoring the ambiance for as long as they can! People stay late in Town Square during Halloween Time!